Home Behind Enemy Lines Prison Stories Georgia prisoners’ strike: What would Dr. King say or do? Eight days after the start of Georgia’s historic prisoners’ strike, in which thousands of inmates in at least six prisons refused to leave their cells, demanding wages for work, education and self-improvement programs, medical care, better access to their families and more, representatives of the communities the inmates came from met in downtown Atlanta with state corrections officials. The community delegation, calling itself the Concerned Coalition to Protect Prisoners Rights, was headed by Ed Dubose of the NAACP of Georgia’s state conference, and included representatives from the US Human Rights Organization, the Nation of Islam, the Green Party of Georgia, The Ordinary Peoples Society and attorneys from the ACLU of Georgia, the Texas Criminal Justice Coalition and elsewhere, along with state Rep. Roberta Abdul-Salaam. State officials claimed they knew about the strike action well in advance and said they locked the institutions down as a preemptive measure. They declared they’d confiscated more than a hundred cell phones, mostly in public places, and identified dozens of inmates whom they believed were leaders of the strike. They admitted confining these inmates to isolation and in some cases transferring them to other institutions. The coalition asserted that brutal reprisals were being taken against nonviolent strikers by prison authorities and that constant threats were being made against inmates. These incidents, the coalition insisted, along with the vast gulf between the reasonable demands of the inmates and some of the well-known conditions in the state’s penal institutions, made the immediate entry into the affected prisons by a fact finding team of advocates, community representatives and attorneys at the earliest moment an absolute necessity. The meeting adjourned awaiting the state’s decision. And late Friday afternoon, state corrections officials agreed to access by a small number of delegated observers, who would visit Macon State Prison, some two hours south of Atlanta the following Monday. The observers who visited Macon State on Dec. 20 would not comment on what they saw and heard, except to confirm that they did interview staff and prisoners for about five hours. Macon State, some said, was the institution chosen by the Department of Corrections. Subsequent visits would have to be made to other institutions, they confirmed, including some of those where the alleged strike leaders were being held. “We understand where we are and how we got here,” explained Rev. Kenny Glasgow of The Ordinary Peoples Society (TOPS) after his visit to Macon State. A former prisoner himself who spent 14 years behind the walls, Glasgow runs a series of re-entry programs for former inmates in Georgia and Alabama. The Concerned Coalition to Protect Prisoners Rights is expected to request to visit at least one more Georgia penal institution before the year ends to continue its fact finding process. Coalition spokespeople have been deluged with messages of solidarity and support from across the country and around the world. 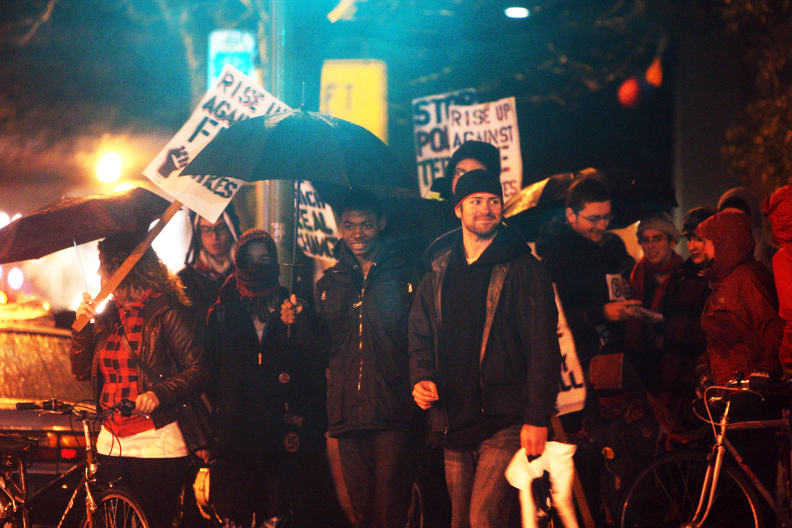 Meetings, marches and demonstrations have taken place in Oakland, Detroit and New York and elsewhere. The Center for Constitutional Rights and other outfits are circulating online petitions which have garnered thousands of signatures in support of the prisoners. Those wishing to contact the coalition via email can do so at concernedcoalitionga@gmail.com. In about three weeks we’ll all be celebrating the Jan. 15 anniversary of Dr. Martin Luther King’s birth. Many have remarked on the great distance between the actual life and work of Dr. King and the empty plaster saint of nonviolence that some have turned him into. The truth is that the living Martin Luther King was a fearless opponent of injustice, a man unafraid of endorsing unpopular causes, so long as these causes were just. If Dr. King were alive today he would wrap his arms around the cause of Georgia’s and this nation’s prisoners. Work without wages is indeed close to slavery. Even if the 13th Amendment permits “involuntary servitude” of those convicted of crimes, Dr. King might rightly observe that this was passed almost a century and a half ago and that many things “legal” are neither moral nor advisable. The U.S. has 4 1/2 percent of the world’s population and nearly 25 percent of its prisoners. Georgia leads the nation with an astounding one in 13 of its adult citizens in prisons and jails or under court and correctional supervision, thanks to innovations like the privatization of misdemeanor probations. When advocating ever-longer sentences becomes a standard campaign tactic for ambitious politicians, when fortunes are made overcharging inmate families for phone calls and raking off 10 percent and more of paltry funds families send their loved ones, when prisons become growth industries with their own lobbyists, punishment has become a crime. 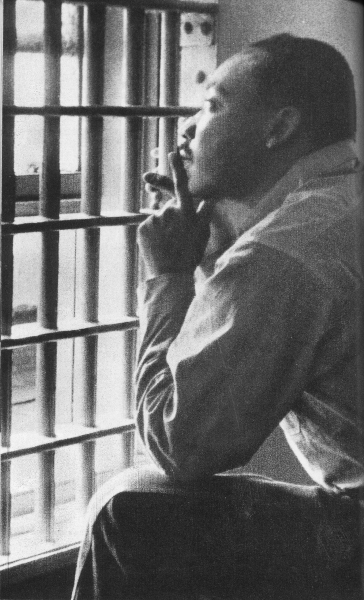 Any holiday celebration, any dinner, parade or commemoration of Dr. King’s life and work that does not embrace the cause of Georgia’s and the nation’s prisoners, that does not critically examine the fact that America’s current policy of mass incarceration, is an empty one, is a hollow mockery of the man King was and the movement he stood for. More than 20,000 in Atlanta march in observance of Dr. King’s life and work every year. The shiny new sanctuary of Ebenezer Baptist Church is always filled with dignitaries on that day. Let’s see how many signs there are outside the church supporting the prisoners on King’s day in Atlanta and around the country. And let’s see if the dignitaries inside Ebenezer can even bring themselves to mention the people behind the walls, the locked down and the left out, who are truly Dr. King’s people. And ours. Bruce A. Dixon is managing editor of Black Agenda Report, and a member of the state committee of the Georgia Green Party. 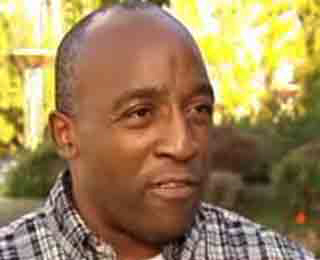 He can be reached at bruce.dixon@blackagendareport.com. This story first appeared on Black Agenda Report.